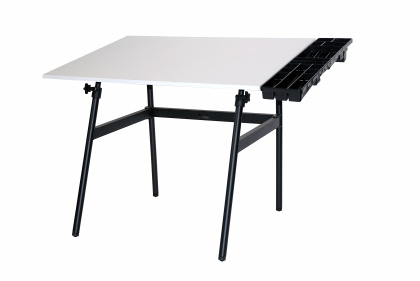 This sturdy but foldable drafting table offers the perfect solution for those who must find workable space in a small home or office at a comfortable height. The Berkeley Classic table combines a dark base with a white working space top (30 x 42”) to make the best use of available light. Use it for any artistic, artisanal, or drafting project and then store it away when you’re finished. If you work professionally from your home, the Berkeley Classic will provide a professional and solid surface for drawing, painting, woodblocking, drafting, beading and jewelry, or any other type of careful and close work. If you are a hobbyist interested in scrapbooking, sewing or embroidery, or design, the Berkeley Classic will offer an inspiringly clear and open space for your passion. This product is more durable and sturdy than any other portable table currently available online. Requires assembly. The stylish Berkeley Classic table, with its elegant black legs and bold white top, supports any project you dare to take on, from painting portraits and sculpting soap dishes to simply snacking on pretzels and sodas while patiently piecing together a picture puzzle. The spacious top sits firmly on strong, tube steel legs, making it ideal as a drafting table, and the perfect place to park your laptop while you wax poetic. Best of all, when the masterpiece is complete, or when the pasta is finally done, the Berkeley Classic quickly folds up for easy, convenient storage. You might not want to fold the Berkeley Classic up just yet, however, because its sleek, strong European design and easy care surface might be just the place to serve that same old mac and cheese dinner, turning it into a superb supper! The Berkeley Classic table helps you create your masterpiece and save space, too!